As human beings, we tend to overthink things. The complexity of a situation drives us to consider every variable, but once we do that, we can start to lose focus on what's most important, and what drove us to consider the situation in the first place. That's especially true as it relates to major software implementations such as a new CMS. The nature of the situation, which will not only require significant resources but also change business operations for the foreseeable future, makes it easy to get lost in the details. But while it's understandable, doing so can also limit the success you will have with the new software. It's time to stop overthinking your CMS, and keep your focus on its main purpose. The core functionality of a CMS is in its name: Content Management System. A CMS, in other words, should make it easy for you to accomplish three things: adding, editing, and deleting content from your website. Of course, reality can get complicated. You may have an editing chain in place before content can be published, comments on your content need to be monitored, and you need a CMS that can help you improve your search engine optimization. But all of these additional features, ultimately, should come back to the core functionality of the software: managing your content. The inverse of the above is true as it relates to the expectations you should NOT have for your CMS. Put simply, any function that does not in some way relate to managing content may not be relevant for the function of the CMS, which means you may not want to muddy the waters. When you build a website, it's tempting to shoot for the stars. You want it to achieve complex processes that help you better run your business and improve user experience, and in many ways, you are not wrong to expect it. Much of those expectations come from the ability complex web systems now offer. Naturally, any software installation runs into additional risks as it increases in complexity. The more features you add, the higher the chance something goes wrong and crashes the system. If everything goes right, a complex install seems like a great idea. But will that occur? That's a different question entirely. To make matters worse, even a successful install may not lead to the anticipated results. The more complex your CMS, the more troubles your end users will have as they access the system to perform their job. 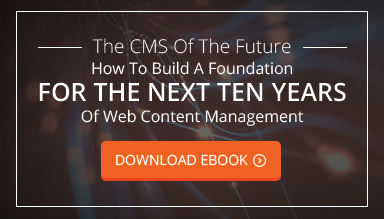 Again, it's worth repeating: your CMS should help you manage your content. Anything that prevents your digital team from doing just that goes directly against the intended purpose of your CMS. Are you looking for someone who can help you implement a CMS that helps you accomplish the core features of what a content management system needs to accomplish? Are you trying to return your website focus back to the simple steps of adding, editing, and deleting content? If so, we'd love to have a chat. To get help with a CMS install that does not complicate the situation but focuses on its core capabilities, contact us.